Bathroom updates can be cheap and easy – new faucets and lighting can give a space a whole new feel for a couple hundred dollars. But if you’re looking to make a big impact with a new shower, be prepared to spend more – A LOT more. These tips will help you make the best decisions. You have a few options for the shower floor: a shower pan or tile. A shower pan is an easy install because it is a one-piece unit, but it’s not going to give you a personalized look. Depending on the size and configuration of your shower and the quality of the shower pan, it can run you anywhere from just over $100 to several hundred. Tile options for floors run the gamut from large-format tile to mosaics and everything in between. Cost can vary widely depending on what you choose; hit the clearance or closeout section and you can have your shower floor tile knocked out for the price of lunch. Splurge on imported marble tile and you could be up over $15 a square foot, just for materials. 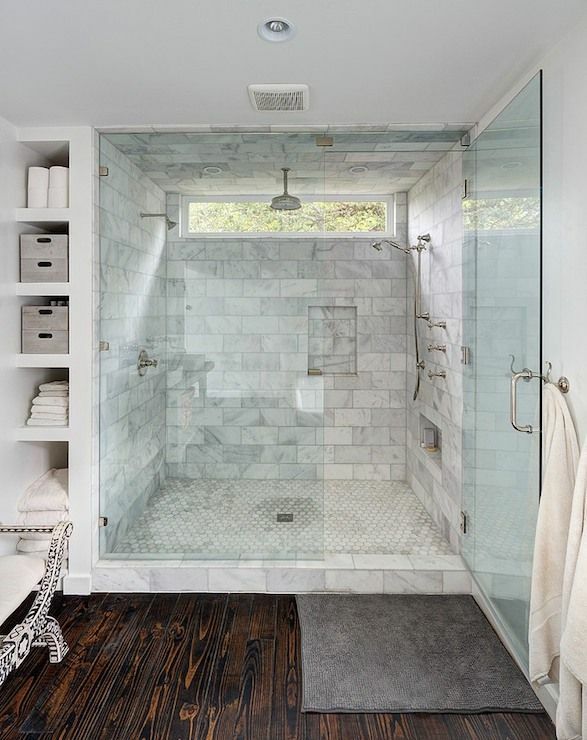 Troubleshooting: Regardless of what material you choose for the shower floor, there are a few things you’ll want to keep in mind. Protecting yourself against leaks and mold is obviously critical. Proper waterproofing is key, and out of our DIY-loving capabilities. If you’re going for it, Pro Trade Craft has some great info. As we embarked on our recent bathroom remodel, we discovered that there was nothing but dirt underneath our shower pan. While you ponder whether or not there may be recourse against the builder for what is clearly a shoddy building practice (one that causes said shower pan to crack, kicking off our unintentional remodel), learn from our misfortune: make sure you have the proper structural support underneath before you lay anything down. Choosing your wall tile may launch you into an emotional spiral as you weigh endless options and try to choose between multiple color families, sizes, styles, finishes, and applications, and then weigh how this decision will impact everything else in the bathroom, and in the house. Could just be us, though. 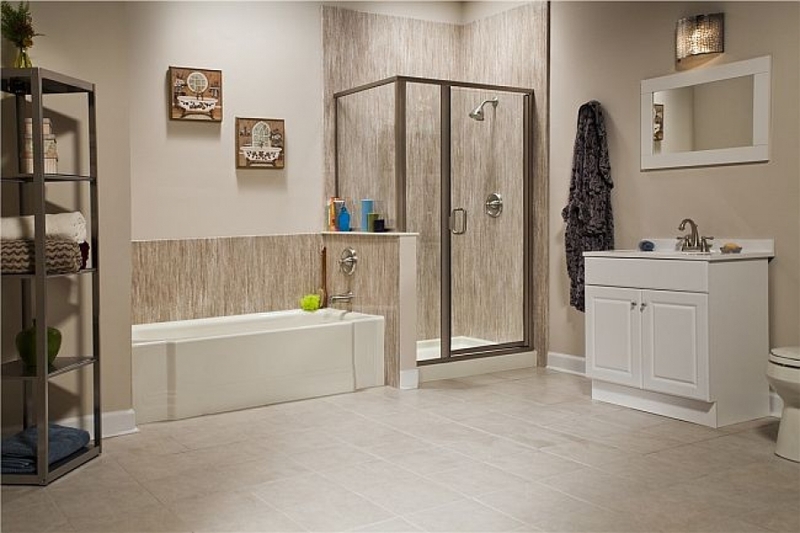 Perhaps these 8 Top trends in Bathroom Tile Design will help. Because budget will probably be a consideration as you narrow down options, think about this: You can get a high-end look without the high cost by going with a larger-format tile and using smaller, more expensive pieces as accents. Are you good with a simple showerhead or do you envision a spa-type environment? When you’re weighing form against function, it can be hard to choose which one is more important. While we have seriously thought about something like this, we opted to keep $1,700 of that $1,900 and spring for a simpler multi-head shower system. Plus, rainheads are overrated for anyone who doesn’t want to get their hair wet every time they shower. You’ll also have to consider your finishes – Chrome? Antique bronze? Black? – although this will be easier if you’re matching existing finishes in the bathroom. (If you’ll be redoing your faucets and lighting, get ready for yet another decision!). If you’ve never redone a shower, the price of shower doors may be a rude awakening. Frameless doors are the most current trend and provide a high-end look, and the price reflects it. Actual prices will depend on a number of factors – size and configuration of your shower, measurements of the doors, thickness and finish of the glass, type of hinge, etc. If you go frameless, don’t be surprised to get an estimate with a two followed by a comma and three more numbers. Framed doors will cost you less, but, in some cases, the cost savings may not be worth it if you’re looking for a streamlined look. As with many other home improvements, you can find significant saving if you’re willing to make some compromises, do a ton of research, and do some (or all!) of the work yourself.